I have always been hooked on gold — I think it's the Leo in me. My prom dress was gold (ha! ), my jewelry has (almost) always been gold, and there are accents of it all over my house. 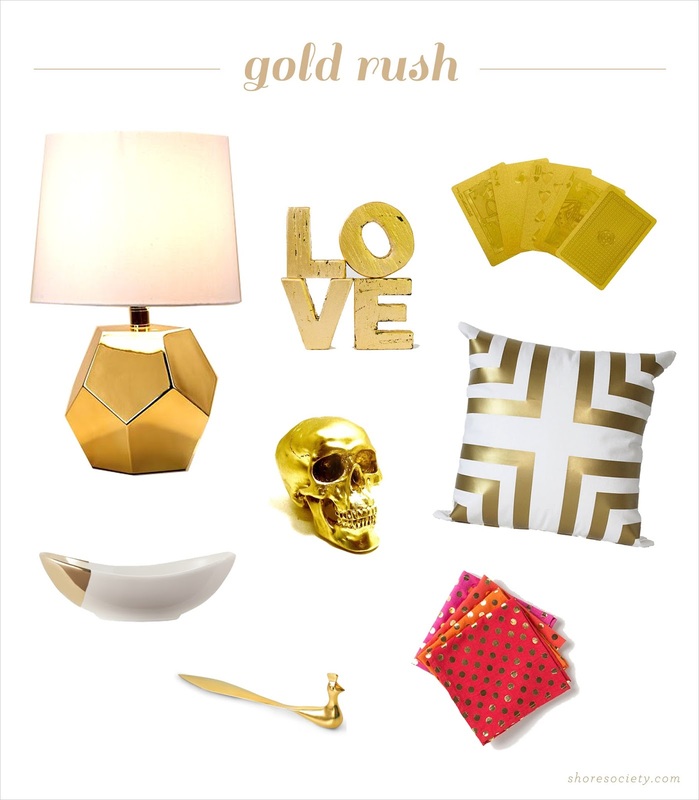 Accessorizing your closet with gold is easy — decorating with it poses a bit more of a challenge. Gold in decor can be intimidating, as brass accents in the wrong places can say '80s mod, but in the right touches it can add a bit of unapologetic glam. A tip to pulling off the look is to keep silhouettes simple and modern — too much embellishment and detail can make gold come across as fussy and antiquated. Pairing with white and neutrals keeps the look polished, and conversely, pairing with bright colors can create a global feel. Gold can also add a geological touch to rustic decor — this faceted table lamp would look great on a natural wood dresser. It can also glam up an everyday item — placing these gold playing cards out on your coffee table would entice anyone into a game of poker. Have you embraced gold as a trend, and do you think it's here to stay? I'm obsessed with gold and love the idea of bringing it indoors. Will you please decorate my life? What are some of your favorite materials to pair with gold? I love wood accents, but I'd love to hear what colors you'd pair it with. My favorite colors to pair with gold are blues - like navy, cobalt, and turquoise. Mint looks great too - but as for the rest of the green family, I don't think it meshes well. It also looks great with pinks and peaches (obviously...one of my fave combos)! And of course, black and white. I heart it! I love gold! (I'm a Leo too). I want a rose gold engagement ring...if my boyfriend ever proposes, haha! But seriously, I love gold. As jewelry, as an accent piece, whatever. I think it's classic and timeless, so long as it's not gaudy or overdone. A rich, cobalt blue looks lovely and classy with gold and brassy metallics. Maybe with a touch of peach as well? I agree - it is timeless, and I'm glad it's having a moment right now. Totally with you on the peach and blues - those are the best gold partners! Our guest room (aka my closet/vanity room) is peach and we have lots of white with touches of gold in there, it's perfect! I love gold! I don't have much of it around my house but love gold accessories. cute blog! i'm your newest follower!